Each of these five types of STAR Tips™ -- color coded as orange, red, black, blue, and green -- has a distinct profile, offering a unique combination of length and diameter. That makes Westone STAR Tips™ perfect for anyone seeking the best fit possible from an off-the-shelf (aka "universal fit") earphone tip. These silicone earphone tips are as close as you can get to a true custom fit without actually moving up to professional lab custom molds for your earphones (which are significantly more expensive!). 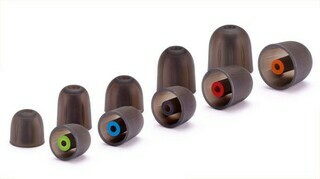 This combo pack contains 5 pairs of Westone STAR Tips: 1 pair each of orange, red, black, blue, and green tips. Try them all and find the very best earphone tips to fit your unique ears. STAR Tips™ are made to the exacting, high-quality standards you expect from an industry leader such as Westone. The silicone material itself is high-purity medical grade silicone that is hypoallergenic, biocompatible, durable, and comfortable. Specially designed flex zones inside each ear tip also ensure these silicone tips will conform nicely to the shape of your ear canal, improving fit even further -- which in turn will help keep your earphones in place securely and comfortably, and with a good acoustic seal so you can experience the very best sound quality your earphones or in-ear monitors have to offer. Already know which STAR Tips color/size you prefer? You can buy single pairs (or hundreds!) here. Tip: If you prefer a foam tip over a silicone tip, check out our Westone True-Fit™ Tips Combo Pack. Want to try 'em all? Check out our Westone Tips for In-Ear Monitors and Earphones Ultra Combo Pack, which contains 5 pairs of True-Fit foam tips and 5 pairs of STAR silicone tips, so you can find the perfect replacement ear tips for your favorite in-ear earphones quickly, easily, and at an affordable price, too. Westone STAR Tips™ for Universal In-Ear Monitors and Earphones Combo Pack (5 Pairs)5gojetsJanuary 3, 2014Got these to try on Audeo PFE112 earphones. They are a little tight to get on the earphones, but work fine, good selection of sizes to get a better fit. The original tips are a little slippery after a while in the gym.